I landed in hospital quite unexpectedly earlier this week, my body voted my appendix out, and decided to cause a bit of chaos in the process. Not to worry, 5 days later, I'm out of hospital and being looked after very well by dear friends (the children are off gallivanting with my mum and step-dad!! ), and as I've had so much time on my hands (*snort* - most of it was spent anaesthetised, nauseated or just dealing with pain, lol!!! ), I've been trying to keep distracted with knitting. 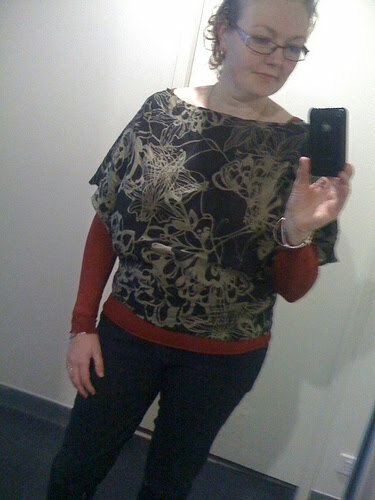 I've been working on Elizabeth Zimmermann's February Baby Sweater (Ravelry link), and am now on the home stretch. 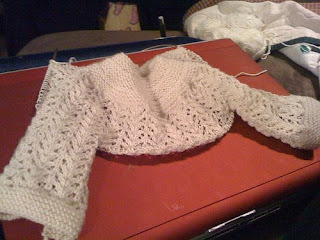 True to form, I started this cardi for a baby last year, she is now 15 months old, so the cardi is now for a new babe. I have at least another week off work, so this will be my goal, to get it finished by the end of the week.